Welcome to Razzoom´s Supercalifragilisticexpealidocious Theme Park of joy User Page! Razzoom Nooze News Flash: Shops closed, SlyPod Store closed, but hey, good times. afr-1 Hierdie gebruiker kan Afrikaans praat met 'n bietjie kennis. nl-1 Deze gebruiker kan Nederlands spreken op laag niveau. This user is Razzoom "MarioKart" Johnson, Senior. This User goes to Fawful117's Item Shop! This user also has 228 BCs!! This user should go Kablooey! He likes Banjo-Kazooie! This user feels empathy for Mr.Whiskers! Nyan nyan nyan nyan nyan nyan nyan! sprite-2 This user is intermediate on ripping sprites. #Razzoomchat This user can often be found on his own Chatroom at #Razzoomchat! Don´t forget kids, chatting is fun for the whole family! This user owns Razzoom´s Friendz Shop! This User also is rich! This user is a sweet friends of Super Candy. 80px This user hasn´t been known to steal user boxes without permission. But he stole this one from someone that stole this one from someone who stole this one from someone that stole this one from the personage who made it, and he didn't even ask! He`s serious. . This user thinks that webOS is awesome! 50px This user thinks that Mario can create Portals...Look! This user likes the Fawful Express! Oh no, not the Transformation!! Oh yes, I have got Spy Guys... and...they...are...watching...YOU! 6 SHRAZZOOB/SHROOB INVASION! OH MAH GAHD IT´S SHRAZZOOB!!! Who said "Hey you, get off of my cloud!" ? Who is Pricess Peach´s Knight in shining armour? And finally, who is the Donkey Kong from the Game "Donkey Kong"? 5th-9th Prize: Something from my Shop - Limited to things up to 100 Friendz Coins. 10th-Last Prize: A shop Voucher worth 50 Friendz Coins. This user is protected by Razzoom "MarioKart" Johnson, Senior´s Maskerade Spotade service. If the Userbox Tower isn´t enough, here is some Info about me. Name: Razzoom "MarioKart" Johnson, Senior. Likes: Woohoo Blend and Biscuits. Dislikes: Losing a race , Losing a bet and rain. OH MAH GAHD ITS SHRAZZOOB!! SHRAZZOOB/SHROOB INVASION! OH MAH GAHD IT´S SHRAZZOOB!!! Shroob Shroob Shroob Shrazzoob Shroob! Shroob Shroob Shroob. Shrazzoob Shrooboid Brat Tashrooba Shroob Shroob! Shroob!!!! Shroob Shroob Shroob Shroob Shroob... Shrazzoob!!! SHROOB SHRAZZOOB!Shroob Shroob Shrooboid Brat Shroob! SHROOBILY! PRINCESS SHROOB SHROOB SHROOB! Shroob...Tashrooba shroobs shrooby. SHROOB, Planet Shroob SHROOB SHROOB. Shroobsy shroob, shroobificate shroobsa. SHROOBSA SHROOBSONIA SHROOBSE SHROOBSO. (Translation: Shroob leader Mister Shrazzoob here! Come here now. Shrazzoob, Shrooboid Brat, Tashrooba need you! NOW!!!! So now the boring by...Shrazzoob!!! Hear Shrazzoob! Let´s get Shrooboid Brat now! Quickly! Princess Shroob needs us! And... Tashrooba truly yours. GO, Planet Shroob neds you. Now you, shroobificate everyone. EVERYONE IN THIS ROOM! After defeating Shrazzoob I now have a chat! It´s #Razzoomchat! Let´s meet there!!! By email- click on E-mail this user! Super Mario Boards account arrived! With the release of SlyOS 2.8 Peach arrived and SlyOS 3.0 Cherry coming, we're going to reward you for creating a SlyOS app. Send a PM to RAZZOOM with the code or eMail it via 'email this user' function. And of course effort put into it! Whoever submits an App will get it into the Store (after checking) and also bag a SlyPod with 50 Friendz Coins! Me on the Public Transport Switchboard at New Aqua Bay in Toad Town. I wanted to go on the K64, also by the MKTC. I payed a Lakitu to take the photo, by the way. I´m not in the Picture, but Mario and Parakarry are, as I took this Picture with my trusty Polaroid by myself. Me on the Public Transport Switchboard at Old Sand District, after taking the K64 from Toad Town to Dry Dry Ruins. Me on the Public Transport Tram at Goldmine Valley after Old Sand District. I was on the W Line. After that trip I got on a Wiggler Bus on Mushroom Bridge. I´m in the Public Transport Wiggler Bus on the right passing Mario and Bowser in Mushroom City. They were having a Race. I wanted to join, but someone stole my Car. The Use of Switchboards, Trains , Trams and Wiggler Buses is very clever. Especially that they go all over the place. 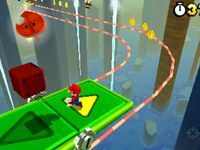 For example, the Wiggler Buses go over Mushroom Bridge and into Mushroom City, the Las Vegas of the Mushroom Kingdom. I went to go and do some betting, as I always do. Betting, not take Wiggler Buses to Mushroom City. On my trip at New Aqua Bay I saw a Station that was called Toad Town Square, which was Literally just a Plattform with a Warp Box and two ?-Boxes. No-one was there. It was a lovely day and use the MKTC´s Public Transport even more now. And the Trams are Ingenious! They can go on the Ground and in the air. And now to the Bone Public Transport Corporation. They have BoneMonorails, BoneBoats and BoneTrains. They offer BoneCards, but, as the BPTC only operate in areas with Lava, It isn´t really worth it. Travelling on the BoneMonorails is a very warm Experience, as they only go over Lava. Here I am in Lava Town near Melty Molten Galaxy. Travelling on the BoneTrains is quite like on the Switchboards, and it also is very warm Experience, as they only go over Lava. Here I am in Lavalia near Lava Town. Travelling on the BoneBoats is unique experience, especially here at Lake Lava.